Acoustic guitar legend Richard Gilewitz will perform Nov. 1 at Vegetable Buddies, 129 N. Michigan St., in downtown South Bend. His between song banter is lively too. Owners Stephen and Mary Merriman don’t worry about the rhythm section at the Tuesday night open jam session at their venue, Merrimans’ Playhouse, 1211 Mishawaka Ave., South Bend. Stephen plays the drums and Mary plays the bass, so they can fill in as needed, and they often do. Other nights, they host touring acts playing a variety of jazz subgenres. On Oct. 27, it’s the Chicago-based trio Twin Talk, led by the young bassist Katie Ernst. The Joe Policastro Trio performs Nov. 7, highlighting cuts from their recent release “Screen Sounds,” which explores a blend of jazz and film scores. A potent guitar duo plays Nov. 30: Balkan wizard Goran Ivanovic and internationally celebrated virtuoso Fareed Haque. The Snyders provide some classic crooning Dec. 7. The venue is quite intimate, so the bigger names can sell out quickly. For tickets, call (574) 329-3430 or visit www.merrimansplayhouse.com. The Goshen College Music Center has some star power in its new 2018-2019 Performing Arts Series, beginning Oct. 16 with jazz legend Diana Krall, one of the truly elite singers of the genre. On Nov. 3, it’s a new Americana supergroup called I’m With Her. Sara Watkins, Sarah Jarosz and Aoife O’Donovan came to prominence as solo acts and as members of bands such as Nickel Creek and Crooked Still. Their new efforts already are coming to acclaim. On Dec. 15, the 5 Browns bring their unique approach to classical piano(s) to Goshen. Siblings Ryan, Melody, Gregory, Deondra and Desirae have taken the world by storm since they all graduated from Juilliard and embarked on a career as the 5 Browns. The group since has been on the top slot of the Billboard Classical Album Chart three times. Call (574) 535-7361 or visit www.gcmusiccenter.org. The musical adaptation of Frances Hodgson Burnett’s children’s novel, “The Secret Garden,” runs at South Bend Civic Theatre from Oct. 12 through 28. The theatre puts on a packed schedule of contemporary musicals and plays as well as 20th century classics. It’s rare, however, that it will put on Shakespeare, making the run of “As You Like It” something of a treat Nov. 9 through 18. South Bend Civic Theatre’s two holiday shows have overlapping schedules: Phil Olson’s raucous comedy “A Nice Family Christmas” runs from Nov. 30 to Dec. 15 at the smaller Warner Studio Theatre, and “The Christmas Schooner,” a moving musical about an overworked shipping captain, runs in the big Wilson Auditorium from Dec. 1 through 23. Learn more at (574) 234-1112 or visit www.sbct.org. Vegetable Buddies, 129 N. Michigan St., is downtown South Bend’s main concert club for blues and rock, recently expanding its offerings to regular reggae shows too. There also are plenty of unique one-offs. The South Bend Hot Patooties host a special Halloween version of their campy “Rocky Horror” shadowcast act Oct. 27. 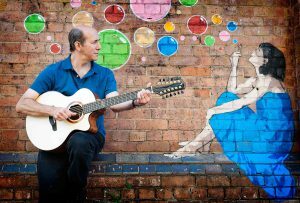 On Nov. 1, Richard Gilewitz appears for a concert that pits his absolute mastery of fingerstyle guitar with some between-song stage banter that would be the envy of most stand-up comedians. For tickets or to see the full schedule of events, call (574) 232-0954 or visit www.buddiesdtsb.com. The South Bend Symphony Orchestra visits the University of Notre Dame’s DeBartolo Performing Arts Center on Oct. 21 for a concert of works by Philip Glass and John Liberatore, as well as the Beethoven Symphony No. 1. The orchestra returns to its usual home, the Morris Performing Arts Center downtown, to close out the year with a Tchaikovsky-themed concert Nov. 3, and then two performances of its beloved “Home for the Holidays” program, Dec. 15 and 16. Call (574) 232-6343 or visit www.southbendsymphony.org.